What you have to know as a pack leader when planning a ride out with your pack. Riding with your friends in a nice scenery against the wind can be an ecstatic shared experience. Here are 10 things for you to become the best pack leader ever! First things first. Planning your route. Knowing where you are going is crucial as the leader, for safety of the group and to avoid losing time at the stops planning steps ahead. You can discover routes in your area using the RISER App. Think about what you want your pack to experience. Is it a chilled weekend ride to enjoy the scenery or is it an asphalt-shredding fuel-absorbing thrill ride. Keep the communication open in your groups about wishes and different needs. Organize a pre-meeting with your pack to discuss the route (or communicate using Getaways on the RISER App), the pace and style of the ride and go over safety signals. Bring the essentials and more. As a pack leader you want to be prepared for any incidents on the way. Of course everyone is responsible for their own safety supplies and should each have their own tool kit. At least one first aid kit in your pack is essential. Consider pointing out one of your riders to be in charge of extra supplies. Things like duct tape, zip ties and a few extra fuses can come in handy on the way. Not to mention napkins, sunscreen or small snack if someone is feeling dizzy. Having a synchronised communication system is highly recommended. That way you can notify each other if you need to take a break or you are low on gas. This will also make keeping track of everyone a whole lot easier and gives you an overview of your pack at all times during the ride. You can soon check out the new Pack Ride feature in the RISER App which helps keeping your pack together and improving the group experience. 4. It’s not a race! 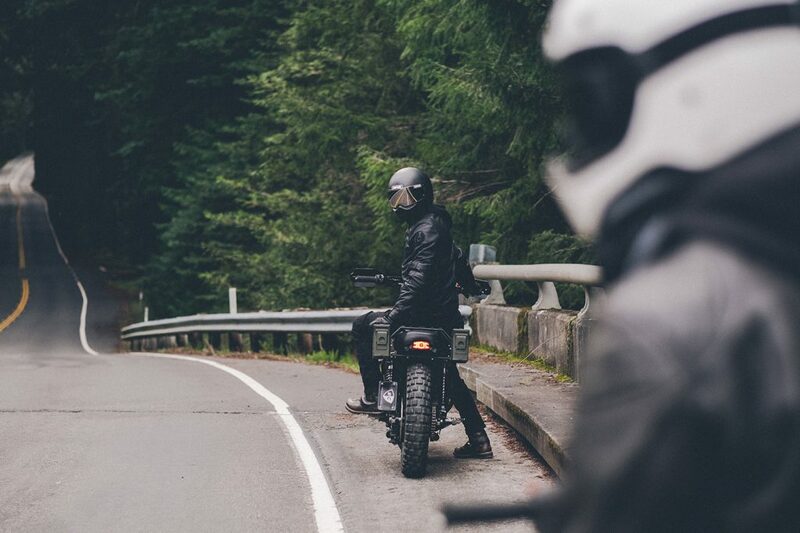 Riding with your friends means looking out for each other. Make it clear to your pack that the ride is not about racing each other. No one should ever pass you as the leader of the group. If you are not used to riding with your pack already, keep in mind that some riders are more experienced than others. Part of being the pack leader is keeping a pace that lets everyone have a good ride, without leaving anyone behind or pushing anyone too far outside their comfort zone. Forming a group of riders with similar experience is of course ideal but if the ability differs make sure to start with a slower pace and you can step it up in between stops. Riding with friends can be a fantastic shared experience but too many in a group can lead to confusion and possibly danger. Keep it limited for safety and comfort reasons. Should the group get bigger than five riders, consider splitting up the group to smaller groups. You can still make the rendezvous together at the stops. Important to discuss before you start your ride together is also the formation of your pack. A staggered formation is usually the safest and most organised. Riding side by side puts everyone at great risk of colliding with each other should it come to a hazard situation. A staggered formation gives each rider a safety cushion to skim around any obstacles occurring. Physical communication during your ride is important. Make sure that everyone in your pack knows the hand signals inside out. This way your followers will recognise your intentions more accurately and accidents are more likely prevented. Depending on where you are in the world, you may want to consider if there are any tolls along the route. You could decide on the leader to carry the toll amount for the whole pack or each member should be prepared to quickly pay the toll and catch up fast on the road. It’s a detail but this will reduce stops at the booths. *** Discover the new Pack Ride feature on RISER App starting with next week! You can use it to easily create group rides with your friends or new fellow riders, keep track of everyone and get notifications or send them so your group never gets torn apart! Ride together, stay together.